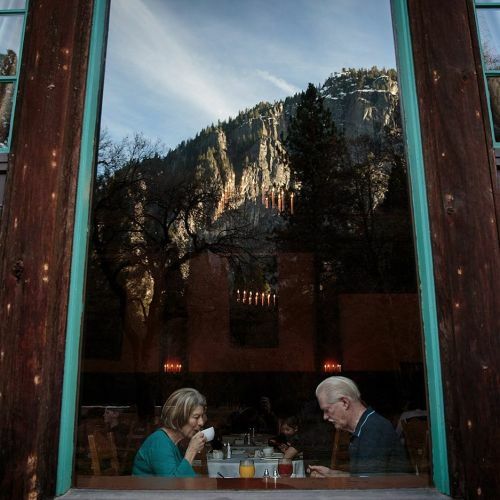 "Carol and Richard Anderson ate breakfast at the former Ahwahnee Hotel, a luxury hotel at Yosemite National Park. After a contract expired with Delaware North, a company that serviced the park, the hotel has been renamed the Majestic #Yosemite Hotel. The reason: Delaware North, which is based in Buffalo, N.Y., has trademarked the name "Yosemite National Park" and other brands affiliated with @yosemitenps, one of the most beloved national parks in the U.S. Now, a bitter contract dispute has embroiled @yosemitenps in the question of who, if anyone, should own the trademark to a park's name and attractions. @maxwhittaker photographed the Ahwahnee — or Majestic Yosemite — Hotel and other @yosemitenps sites." By nytimes on Instagram.